Justin Panneck is an Licensed Professional Counselor (LPC)-intern. Justin typically specializes in crisis and trauma, spiritual crisis, anxiety, substance abuse/addiction, parenting practices, family issues, self-esteem, career counseling, men’s issues, and rites of passage. Justin primarily works with ages 6 and up. Justin holds a PhD in health psychology with a focus on effective coping mechanisms for daily and life stressors as well as alternative healing modalities. He will also receive a Master’s in Marriage, Couple, and Family Counseling with a focus on trauma response and addiction by the summer of 2018 and continue to pursue licensure. Justin also holds a Master’s in education and has spent several years involved in exploring and developing learning motivation for students ages 8 to 11, and has also provided mentorship for troubled adolescents. Justin is an associate professor for Colorado Technical University’s online undergraduate psychology program, and an adjunct faculty of undergraduate psychology at Blue Cliff College. He is also actively involved in professional cultural anthropology associations and consciousness groups and gives annual talks in Ashland, OR and the California Institute of Integral Studies on such topics as consciousness expansion, shamanism, Jungian archetypes, and ethnopharmacology. Justin has spent nearly a decade in the business world as a consultant, corporate trainer, academic advisor, and business leader and has a great deal of experience in motivation and success training, as well as career counseling. His counseling interests include crisis and trauma, spiritual crisis, anxiety, substance abuse/addiction, parenting practices, family issues, self-esteem, career counseling, men’s issues, and rites of passage. He has an eclectic approach to counseling individuals, couples, and families that includes Impact Therapy, mindfulness techniques, eco-therapeutic techniques, Solution-Focused Therapy, Existential Therapy, Acceptance and Commitment Therapy, and Narrative Therapy. Justin believes that getting in touch with nature is the first step in alleviating stress and allows us to reestablish a healthy baseline. He believes that individuals create scripts and myths and that people resist change, although many issues can be resolved by interrupting the familiar patterns and using language and environment in new ways to foster new perspectives. Helping individuals and families re-write their story can help to create more healthy patterns of interaction and living. 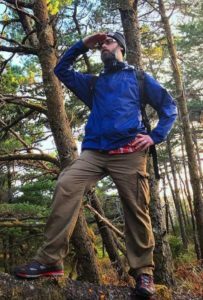 In his spare time, Justin likes to write fiction and poetry; play guitar, flute, and drums; backpack and hike; garden; and is an avid mushroom forager, cultivator, and gourmet cook.